Hardcover, 112 pages, 17.0 x 24.0 cm, 6.7 x 9.4 in. For everyone wanting at last to tell their own mother that they love her – and how much. Not a gift off the shelf, not a box of chocolates or a few flowers – something you made yourself, something coming from the bottom of your heart. 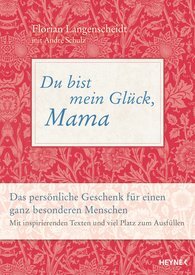 This affectionately designed book by happiness researcher Florian Langenscheidt and André Schulz, with its wealth of inspiring texts and quotations, is an opportunity to give free expression to your emotions and tell your mother in your own words why she is so important to you, why you are grateful to her and what moments you would like to share with her in the future. This is the loveliest way of saying: "Mum, I love you!" – a bouquet of flowers with a difference!